Choosing a night vision device with the vast amount of options can be overwhelming. We spent the last 12 months testing many different models and we have had the joy of trying out the Yukon NVMT. In this The Yukon NVMT 1×24 Head Mount Kit review we are going to show you why this made our list of the best night vision goggles. The Yukon NVMT 1×24 Head Gear Kit (Click here to check price on Amazon) combines durability and quality with the exciting element of hands-free night vision. The NVT is a monocular so it does not have any magnification so that you can see a crystal clear image when you use it. In addition to reducing distortion, this also helps the viewer get better depth perception. The Yukon NVMT is a small and compact monocular that is secured to the head gear by a mounting system that sits directly on the front head strap so that it can be flipped down and back up when not in use for total convenience. One thing that we noticed that should be important to know about the NVMT is that it’s head gear is designed specifically to be used with your right eye only and can not be interchanged for the left. This may be an issue depending on which eye you are most comfortable using. But generally, this won’t be an issue for most right handed people. The NVMT 1×24 also features a separately activated Pulse system IR illuminator that uses a pulsating infrared beam that helps to enhance night vision viewing experience. This night vision monocular also has a simple detaching mechanism which allows the monocular to be taken off the mount for hand-held use easily. One thing we liked is that the Yukon is easy to set up. 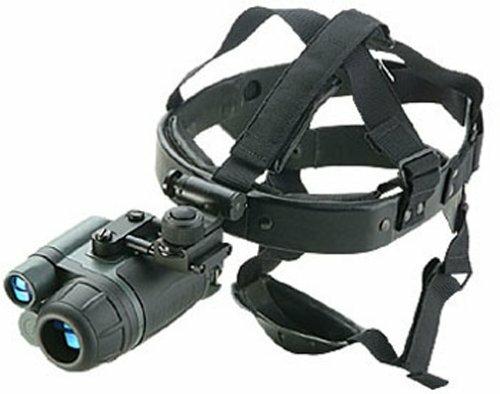 The unit has very high-quality night optics and is very sturdy for the price. You can tell that it was well engineered. The NVMT Goggle 1×24 is backed by Yukon’s Limited Lifetime Warranty, which says a lot about the manufacturers trust in their brand. Q: Does the NVMT Make A Lot of noise? Q: Can you focus the beam? Q: Can the Yukon NVMT be worn over glasses? A: I briefly used mine with reading glasses and it seemed to work. This could, however, cause some focus issues depending on your eyeglass prescription. Testing this night vision device was a cool experience. We always are a fan of night vision devices that come with a head mount, they are just better for general use. 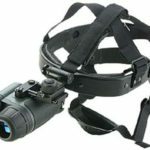 This night vision monocular would be good for many night activities such as night fishing, night hunting, camping, and most recreation night time activities. If you found this The Yukon NVMT 1×24 Head Mount Kit review useful please take a moment to share this review with your friends.